The Warriors celebrate together after advancing back to the state Final four for the second straight year. *Photo courtesy of Melissa Fishbaugh. Earning the chance to play at the state tournament is something ball players never forget. The memories exceed far beyond just the game itself, each moment bringing a thrill never to forget. Last season 13 members of the current Jupiter roster experienced those moments together, and thanks to their dedication and commitment to each other they now all get to enjoy the experience again. 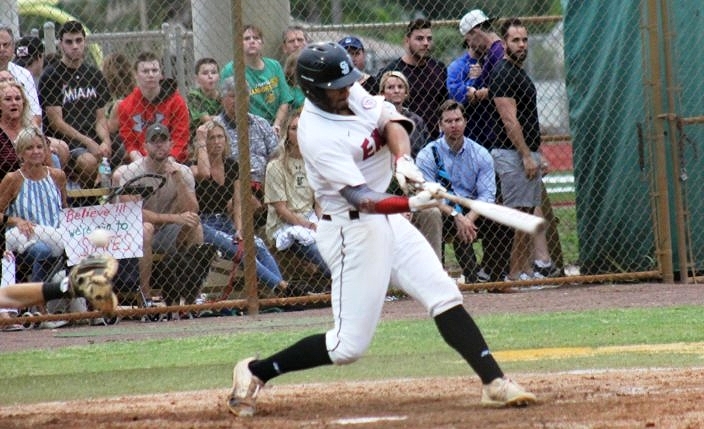 Behind a complete-game gem from junior Jake Garland and just enough offensive support, Jupiter edged the visiting Douglas Eagles 2-1 in Tuesday’s Class 9A Regional Championship. 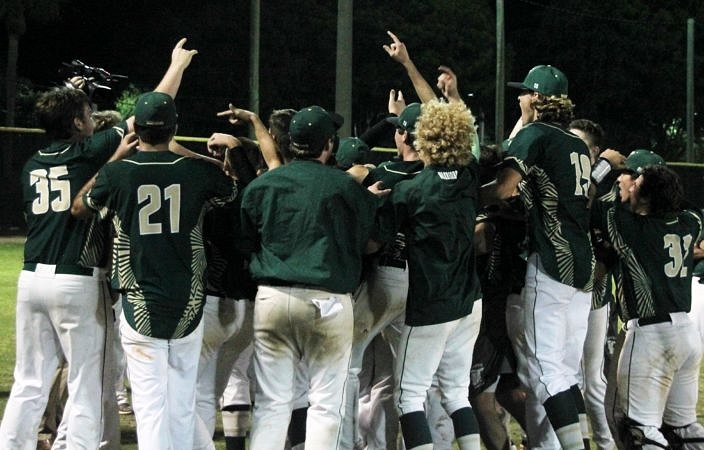 The Warriors (17-11) advance to the state tournament at Hammond Stadium in Fort Myers, where they will face the Columbus Explorers in a 9A state semifinal on June 1st. Columbus advanced with a 1-0 victory over Miami Beach in the other regional final. Hosting its second regional final under manager Andy Mook, Jupiter fed off the environment. Garland hit his spots and the defense made the plays behind him, holding the Eagles (19-7) to one earned run. Garland struck out nine on the night, while allowing one earned run on four hits and two walks. Andrew Jenner tallied the lone run for Douglas, after he doubled to center and scored on an RBI ground out from Coby Mayo in the sixth. Eagles shortstop John Rodriguez takes a hack at a pitch from Garland. Although the Eagles were making contact, it did not generate enough offense in producing just four hits. Scoring chances were limited with so few base runners, and Garland controlled things on the mound. When facing a good team he accepted the fact that a pitcher cannot be afraid to let them try and hit the ball. While the Warriors managed just five hits, they made them count and took command with both runs early on. Peter Cowley singled to right to drive in Dakota Gaillard in the first, and Peyton Moon doubled to left and later scored on a balk for the deciding run in the second. Reaching states is no easy accomplishment, and it is a rare thing to see 13 players that get to enjoy it together again. Along with 11 new teammates this year, Jupiter defied the odds by making it back even despite losing many key figures from last season’s group.